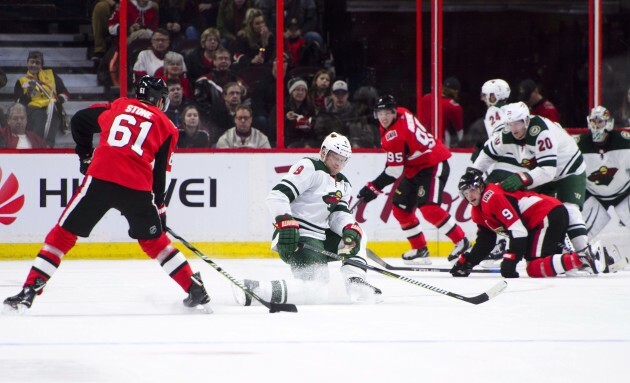 The Wild certainly discovered a workable formula in racking up six goals and a season-high 40 shots in its Tuesday win over the Senators in Ottawa. But not every aspect of that victory is worth duplicating Friday when the team resumes action against the Panthers. Not becoming vulnerable defensively will be key, but the back end can also play an important role in the offense. The unit was involved in that 6-4 win against the Senators, scoring twice and assisting on three others, and that’s a trend Boudreau hopes persists. 1-3: The Wild’s record in the first game of a back-to-back. 555: Blocked shots by the Wild, ranking second in the NHL. 1,400: Career game for center Matt Cullen tonight. 34: Points in 34 games for Panthers center Vincent Trocheck. .936: Save percentage for Florida goalie James Reimer over his last five games. The Panthers return home to begin a four-game homestand after a 2-2-1 road trip. They’re coming off a 3-2 comeback win Tuesday over the Coyotes, the team’s first regulation win since Dec.7. Overall, Florida is third from the bottom in the Eastern Conference with 31 points. Trocheck has had a solid season so far, leading the team in goals (13) and points (34). Reimer has taken over the crease with Roberto Luongo injured (lower body), and Reimer is 7-9-4 with a .901 save percentage and 3.38 goals-against average.